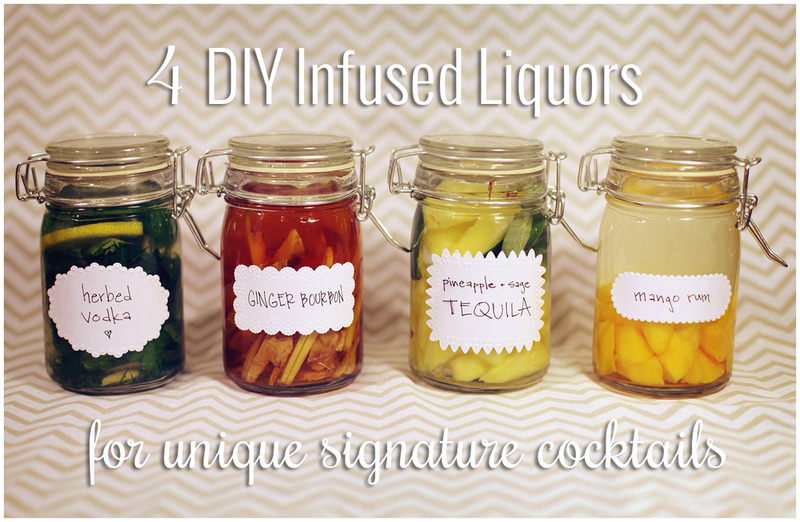 4 DIY Infused Liquors for Unique Signature Cocktails — Carly Romeo & Co. Feeling a little crafty? 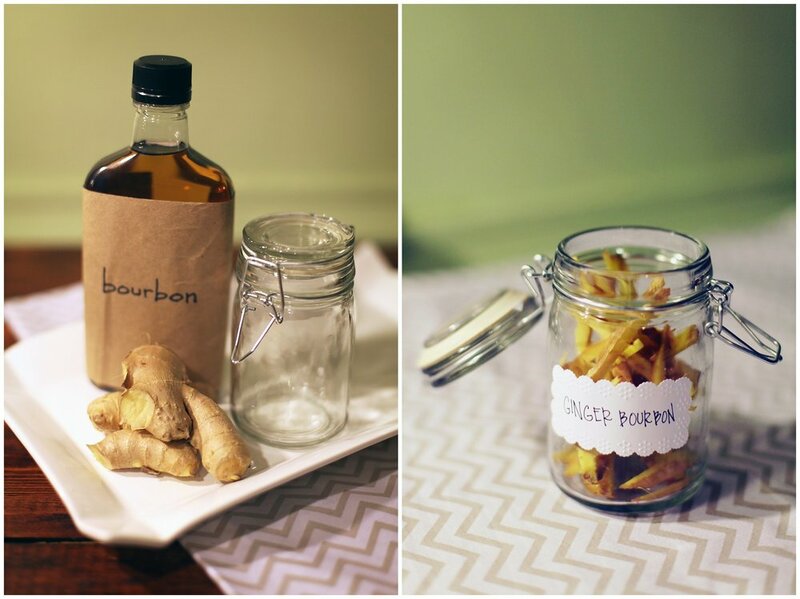 Want to experiment with some handmade booze options for your wedding reception, bridal shower, or just because? Have we got the project for you! If you ask me, the world of flavored liquors has really gotten a little out of hand. Aside from bonkers flavors (Pecan Pie?) and questionable corporate partnerships (Cinnabon? Really? ), the majority of flavored options are full of artificial everything. So if you want something with a little more pizazz and a lot fewer additives, here are four options for DIY flavored liquors (and recommended signature cocktails) that will knock your socks off! 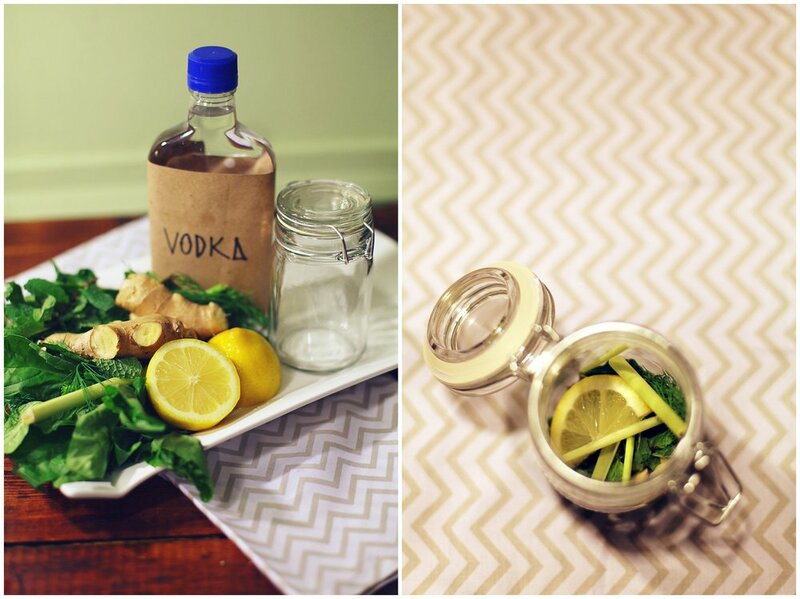 What you'll need: an airtight jar (we got ours at AC Moore for $0.99 each); decent vodka (enough to fill said jar), fresh herbs (we used basil, mint, dill, and lemongrass), plus a tiny bit of fresh ginger and a slice or two of lemon. How to do it: Fill your jar with all your herbs and muddle them well. Add your slice(s) of lemon, pour in the vodka, close jar, and give it a little shakey shake. Store in a cool, dark place no more than 24 hours (or the herbs will make the vodka bitter). After that, strain out your mix-ins and enjoy! Best in: Bloody Mary's and any cocktail that has apple or grapefruit juice. What you'll need: an airtight jar (we got ours at AC Moore for $0.99 each); decent bourbon (enough to fill said jar), fresh ginger. How to do it: Fill your jar with a ton of sliced ginger. Pour in bourbon, close jar, and give it a little shakey shake. Store in a cool, dark place for 3-5 days (or as long as you like). After that, strain out your ginger and enjoy! What you'll need: an airtight jar (we got ours at AC Moore for $0.99 each); decent silver tequila (enough to fill said jar), fresh pineapple, and fresh sage. How to do it: Fill your jar with three parts cubed pineapple for every one part sage. Pour in tequila, close jar, and give it a little shakey shake. Store in a cool, dark place for 2-3 days. After that, strain out your mix-ins and enjoy! What you'll need: an airtight jar (we got ours at AC Moore for $0.99 each); decent rum (enough to fill said jar), fresh mango. How to do it: Fill your jar halfway with cubed mango. 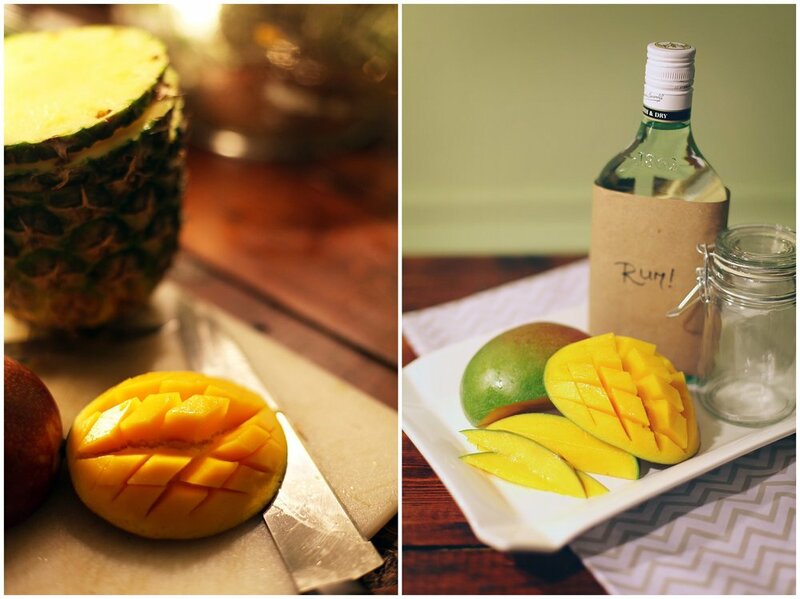 Pour in rum, close jar, and give it a little shakey shake. Store in a cool, dark place for 2-3 days. After that, strain out your mix-ins and enjoy!